Located at the foot of Namsan, Shinheung market was once the center of the local knitwear industry in the 1960s. It had a vibrant and festive market atmosphere, and attracted people from adjacent towns. Over 20,000 people from across the nation flocked to the market looking for jobs up to the 1990s. But the advent of shopping malls and the decline of the knitwear industry in the face of cheap Chinese products in the years that followed spelled doom for the old market located in the upper part of Haebangchon, Seoul. These days, there are just three to four knitwear shops left. The number of residents in the area has also fallen to 12,000 people, with at least 15 percent of them aged over 65. “The number of people wanting to rent a place to open a business (in Shingheung market) went down as its visitors drastically decreased. 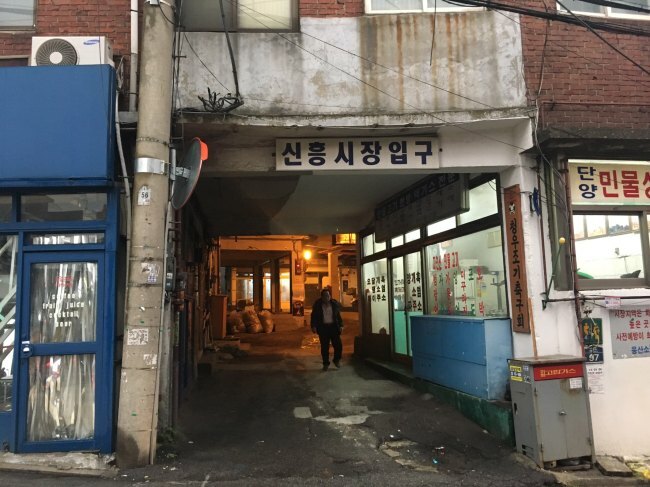 So we tried to renovate shops into houses so people could live here at a cheap price,” said 74-year-old Park Il-young, who has headed an association of business owners at Shinheung market for over a decade. “Businesses here have long been in trouble, I used to hardly believe that the market would be revived,” he said, adding that 43 other members of the association also held the same view until two years ago when the city government came up with the city revitalization project. In 2014, the Seoul Metropolitan Government selected Shinheung market as one of eight urban revitalization projects, including Seongsu-dong in Seongdong-gu and Changshin-dong in Jongno-gu. A project was initiated to transform the market into an art street for textile workers and young business owners. The Seoul Metropolitan Government said that the area is being promoted by art workshops and revitalized by young businesspeople and artists. It said that the main goal of the project is to fully utilize the characteristics of Shinheung market and harmoniously unify residents and visitors. “We will open an art market where residents’ life and art can coexist to improve the general environment and atmosphere of Shinheung market. We are also trying to prevent the gentrification phenomenon here, as gentrification is a growing concern among residents of other parts of Seoul,” said a SMG official. In a bid to deter the displacement of poorer communities, increases in rent and property values, and changes in the district’s character and culture, the SMG earlier this month signed an agreement with 44 business owners at Shinheung market to freeze rental fees there for the next six years. Through this measure, young artists or studio owners would be able to settle in the area with less burden and support revitalization of the town. “I found Shinheung market an attractive place to open a cafe, not only due to the cheap rent, but also the exotic atmosphere that the old traditional market gives. 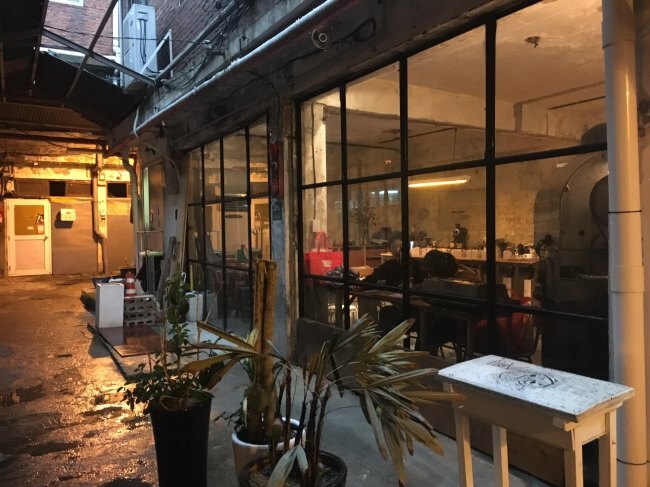 The building was vacant for four years before I moved in, but I tried my best to leave the building as it is, to keep its unique characteristic,” said Ahn Sung-hyun, owner of the coffee shop Orang Orang. Seoul City is pouring 10 billion won ($8.56 million) over the next five years to revitalize the town, with the help of the Ministry of Land, Infrastructure and Transport. From refurbishing old slate ceilings to installing more light stands inside the market to brighten up the place, an urban revitalization project task force has been discussing ways to revive the market with residents, following the first meeting that kicked off in March last year. But city officials say that refurbishment is not the main objective of the revitalization. “We can refurbish old buildings for now. But what happens after this project ends in five years? We are helping residents to be able to revive the town with constant talks and cooperation such as through ideas of creating town rules or installing a common lounge for residents. We are trying to lay a foundation for them to coexist from now,” said Kim Dae-woo, an official from Yongsan-gu Office’s city revitalization division. Currently, a total of 583 members, including tenants, foreign residents, students and shop owners are part of a residents association. “I personally believe strong bonding between residents will initiate people to help revive the area, while the young generation can give fresh ideas to promoting Haebangchon’s Shinheung market,” said Park Ki-dong, who runs a leather crafts studio in Haebangchon. “When residents gather ideas to come up with plans to revive the culture and the atmosphere of the town, there will be a fruitful outcome for this urban revitalization project. It is something like the Saemaeul Movement, which is focused on creating a village community,” said another resident Son Haeng-jo. This year, residents and artists who have studios in Haebangchon hosted the 11th Haebangchon Festival. They not only sold their art projects but helped old residents to sell Korean traditional food such as gochujang, or red pepper paste. But opinions are still split among some residents over the city-led urban revitalization project. According to a Yongsan-gu official who declined to be named, struggles remain between residents and tenants over property value. “There is always opposition when discussion unfolds. Some old residents would rather have the city government reconstruct the whole town, instead of revitalization. Some also did not really like the idea of the rent fee freeze, because they wanted to sell property in the area at a high price and leave this old town,” said him. “Haebangchon is a geographically difficult place to go under reconstruction. But many old residents seem to still have a lingering wish to have their old town reconstructed with clean buildings,” he added.